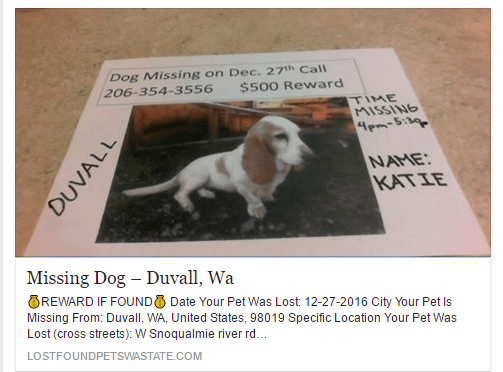 Katie went missing on Dec 27th and lost posters were put up and she was on lost and found pets. One of the BROPS staff saw it and posted it. I then saw it and posted it on our Face Book page with a plee to get her home. Ironically a man showed up at BROPS with a dog named Poppy who he could no longer take care of and relinquished her. Then the gals at BROPS saw the post and thought this is the same dog. They checked and sure enought she was the same dog. Katie was reunited with her loving family! human baby, soon now another baby is expected. Tommy is very comfortable in his new home as you can see. Tommy had been through a lot losing both eyes to Glaucoma once in rescue. ​Has learned to function well with no sight. His new home has a large fenced yard and two loving parents. ​Griffey has landed in the land of leather couches and lazy days sunbathing on the deck. Mike, Rebecca and their basset Molly are excited to have a new addition to the family, after losing their beloved Fred. He is going to be a daddy’s Boy. Tinkerbelle came into rescue 7 years ago in terrible shape. She had been known in rescue as stinker tinker. As you can see she may be old but doesn't stop her from climbing up on the table. Yesterday she found her happy home right where she is in rescue with JP and Alexa. ​Has found his Happy Home with our very own Patty and has settled in with her other dog Magoo. He is blossoming in his new home. He came into rescue as a stray. Bosco came in with Buttercup when owner went into retirement home. Moose has a new name is now . His new family has this to say about him.​We just wanted to give you the one week update on Moose (Boscoe). Moose has settled into his new home and life like a pro. His personality has really bloomed. He is an absolute dream and a "big old pot of honey". We couldn't be happier with him and he is pure joy. Buttercup came into rescue with Bosco when owner went into a retirement home. Now Daisy has her own little girl Reagen and is enjoying being spoiled. Hailey who came to rescue with stage 1 mammary gland cancer and had surgery has found her happy home with a loving family. We are so happy for you Hailey enjoy your new life. Billy has found his Happy Home with Jan and Todd who are very excited. We wish you a very Happy Life!! Happy home pictures for Sam the puppy. He was adopted by Kieth and Cindy Wright in Long Beach. He is happy with his new best pal Beau and Basset sister Doodles.